It gives me immense pleasure as I speak on behalf of the Bhutanese community in Adelaide on this sacred occasion to express our gratitude for Australian government and the Australian people for giving us this identity. Today is a very special day for all the members of Bhutanese community not only those in SA; perhaps not even only in Australia. I am Neeru Khapangi. 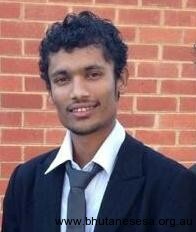 19 years ago, I was born in a refugee camp in Nepal to stateless parents. By birth, I was stateless, identity-less. Bhutan was a fairy-tale when heard it at aged five. A tender mind could rarely imagine what forced my parents leave the country and live as refugees. For 15 years, I wondered for identity. I had listened to the stories from seniors about denial to job, and any other opportunities for personal progress. I leave it up to you to decide what life was with 200 grams of rice a day, without shelter, clothes, higher education and job. And without identity. After 19 years struggle of search for identity, I am overtly happy today that my dream has been realised today. I can speak my language but forgot to read and write. Being the second language, I am very poor in English and don’t know Dzongkha, Bhutan’s national language. That’s the darker side of my linguistic identity. I grew up without wearing my cultural dresses. Chaubandi cholo and fariya look antiques for me. As I learn to live in society heavily influenced by individualism and consumerism, I have begun to feel my rich culture, family and societal bonds, love, affection, respect and sense of brotherhood in collective living are gradually becoming fragile. Australia has given me right to culture and language. But they have become secondary as I struggle here for livelihood. And I am fighting amidst these confusions to seek my social, linguistic, cultural and personal identity. I will continue to fight until I realise this. This is not just the story of Neeru Khapangi but of whole new generation of Bhutanese community. Young and tender minds of Bhutanese Youth Group have come up with all these sentiments, aspirations, enthusiasm and commitments for search of our identity. Thank you Australia, you have given us legal identity. Bhutanese in Australia are indebted for this. This reinvigorates energy within us to commit ourselves to the service of this nation. Australia, we will not forget your support and faith given to us. I strongly believe no one should be compelled become a refugee in this world. 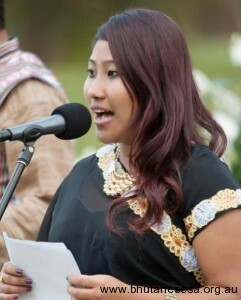 Today, Bhutanese Youth Group expresses gratitude to DIAC who coordinated this special event. MRC provided us physical spaces for our planning and helped us with other stationeries, LCC helped us with computers for our community members get ready for citizenship tests. We are very thankful to them. This is special occasion for us to express gratitude to all organisations, councils and agencies such as Salisbury and Playford Councils, Australian Refugee Association, Anglicare SA, Migrant Health Services, St Vincent De’Paul Society, Baptist Care and many others, who provided support to Bhutanese for settlement in the last five years. BYG is also grateful to Ratan Gazmere, who guided us for this special event. Without him, this occasion would not have been possible. BYG appreciation also goes to Ms. Dil Kumari Karki for her involvement in organising the cultural item on display today and cultural performers. We are also thankful to elders of Bhutanese Australian Association of South Australia who guided us and encouraged us for many social and community activities. As a BAASA auspice team, BYG was and will remain committed to service of the community. May we now request Eugenia Tsoulis, the CEO of Migrant Resource Centre and Nayano Taylor-Neumann, Manager of Lutheran Community Care to come to the stage. And Dom Kafley, who have made selfless efforts for helping our seniors to prepare for citizenship test.